There were many great sales this past Passover, including some obvious barnburner sales at varietal.us, that I did not take part of. However, I did get the chance to pick up a plethora of low-cost kosher and mevushal French Wines, from real French chateaus. While, my palate has no real partiality, I am always ready to enjoy a good low-priced wine that is mevushal, no matter its origin. Why? Because, so many of my friends ask me about good kosher mevushal options, for their restaurants and synagogue events. I just posted an article on the clear QPR leader in Israel, Recanati Winery. What I would love to find is another such winery or importer that brings in quality, reasonably priced wines that may or may not be mevushal. Reasonably priced kosher French wine is like a blue moon, excluding wineries like Viognobles David, and maybe a Willm wine or two. To be honest that is a sad state of affairs! There are so many solid options under 25 dollars from around the world, mevushal or not, but once you place the word French in the search query, the options do not drop off so much as does the quality! There are many options for kosher French wines under 25 dollars, the problem is that the quality of those wines, are so poor that they just sit there on store shelves. Many of them hail from the portfolio of Royal Wines, and bless them for trying, but the quality is still too low. When you move the number up to 50 or so dollars, now you find some very nice options, but that is like moving from first to third in a single bound – not always an option for many of the folks out there. Mind you, one of the very best sparkling wines out there, which happens to also be mevushal, Drappier Champagne, goes for about 47 or so dollars, and is well worth the cost. Now try that same query, without the French wine region and the options are almost endless, especially if you go all the way to 50 dollars! I spoke a bit about this issue when I interviewed Fred David, the head winemaker and owner of Vignobles David, and Shai Ghermezian, executive vice president of Allied Importers, who imports his wines into the country. I asked him about the QPR predicament that is kosher French wine. He explained the complexity and excessive cost of picking multiple times per varietal, as each ripens at their own rate and time. The vines do not wait for any man, Jewish or not, and the grapes can go raisin or explode if the Rabbi cannot make it when it is time to pick. This headache happens over and over again, as each of the varietals ripen, thereby creating one of the quandaries of kosher French wine, which is built on the citadel of multi-varietal blends. With all that said, there is still the clear delineating line of cost that separates the French kosher wines from the mass populace who may well enjoy them, if they could be afforded. It is for this specific reason that I heralded the wines of Vignobles David, as being so special, for besides their obviously good structure and quality, they are reasonably priced and easily available to the average kosher wine client, especially when they are on sale. However, to be clear, price does not enter into the score, in any way. To me if you wish to use scores, as a comparative tool – the two wines must be scored in an objective as possible manner. Thereby, ignoring price from the equation, this allows the viewer to make up his/her own decision based upon the wine notes and their palate, and at that point they can factor in price on their own end to come up with their final choice(s). Still, I do talk about QPR, because inevitably the conversation comes up, being what is the best wine for the price within this or that criteria. It is for that reason, that I talk about QPR, and it is why I was so excited by the wine I had this past weekend. These past few weeks I have been drinking through my stock of rock bottom priced French red wines. Yes, I am more than happy to drink through the undrinkable, so that you do not need to! Think of it as a community service that I am more than happy to help with! The two Vignobles David wines, have already been documented here, and I have tasted again recently, affirming to my appreciation for these wines. I tasted the first two reds (2010 Château de Cor Bugeaud and 2010 Château Bertranon) here, and did not score them all too well. The next two have been tasted in passing, and they are fine examples of low-end French wines with the ever present flavor of wet cardboard, with the Chaban, being the best of those first four. 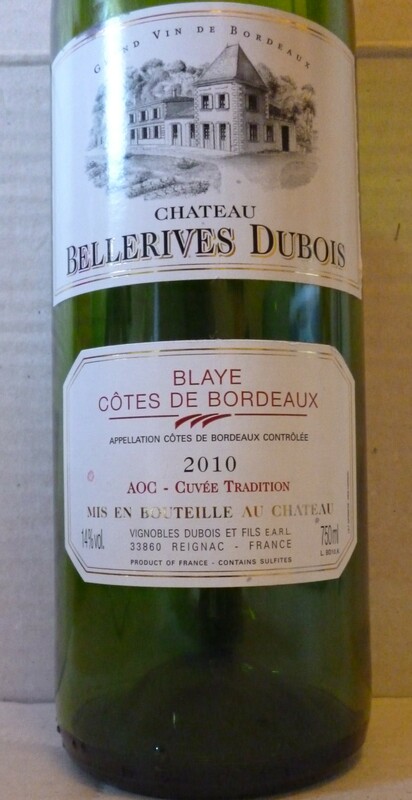 The only true bright-ish light of the group is the 2010 Château Bellerives Dubois. It had lovely unique flavors, enough tannin to keep your attention, and no oak to muddle up the affairs. Truly oak is one of those most abused tools out there in the wine trade. Classically, oak used on good grapes can well bring out roundness and a transfer of phenolic goodness between the embrace of oak and must. However, that embrace can turn deadly, when either the must is not worthy of even wood chips or if the wood is imparted with the undesired cork taint TCA. In the end, oak used on this quality of grapes, is like to place mascara on a pig, it just does not work! It makes the pig even more self-conscious and turns the whole thing into a giant fiasco. Oak is not a spice or condiment that can be used to augment the flavor of wine, if the starting ingredients or environment are inferior. So, there you have it – the winner is below, and again, that is my opinion. I am sure there are folks who will hate this as well. However, I found the lack of oak and the addition of good fruit and structure to be the differentiators in this wine. This is a blend of 70% Merlot and 30% Cabernet Sauvignon and is a wine that has clearly not been aged in oak. The nose on this fruit forward wine explodes out of the bottle with ripe blueberry, dark cherry, nice raspberry, and showing good French terroir in the form of lovely dirt. The mouth on this medium to full-bodied wine exhibits controlled but still not integrating tannin that melds well with blackcurrant, black and purple fruit, red plum, and lovely green expressions in the form of green bell pepper. The finish is long with nice eucalyptus, vanilla, and hints of chocolate. This is a lovely simple yet very enjoyable wine that is mevushal and is a far better alternative to the other mevushal options that are old and tired. Get a bottle of this and give it a try, well worth the 13 dollars it costs (on sale), a very good QPR. Posted on July 11, 2012, in Food and drink, Kosher French Wine, Kosher Red Wine, Wine and tagged Château Bellerives Dubois, Kosher French, wine. Bookmark the permalink. 2 Comments. Not quite sure why the Chateau Thenac Fleur du Perigord didn’t get a mention here. its been favorable reviewed on this blog before and costs under $25.